Wednesday 16, March 2011, the Breton Popular University and l'Expédition Scyllias organized a lecture at the Chambre de commerce et d'industrie du Morbihan in Lorient to debate about the local submerged patrimony. L'Expédition Scyllias was composed of Vincent Alain Gautron and Jean-Louis Maurette who packed the house. They evokated our investigations on contemporary shipwrecks, our aims and projects and, of course, they shared their passion for maritime history through diving. During the lecture, the audience could enjoy the focus on a few interesting but not wellknown topics like Isère, Evangeline, Bassure de Baas and a few other ones, more popular, like Tanche or U 171. Films about some of our underwater investigations were projected and allowed everyone, staying in the dry, to visit these wrecks and dive into this original local history, often misunderstood. A dynamic debate followed. 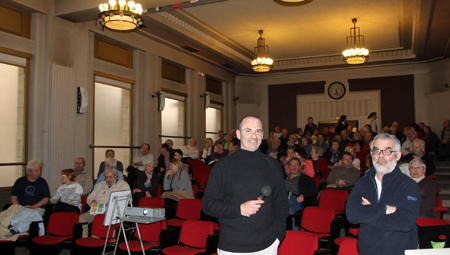 This successfull lecture will assuredly take the lead to other ones ! (courtesy Michel Dirringer - Ouest France). 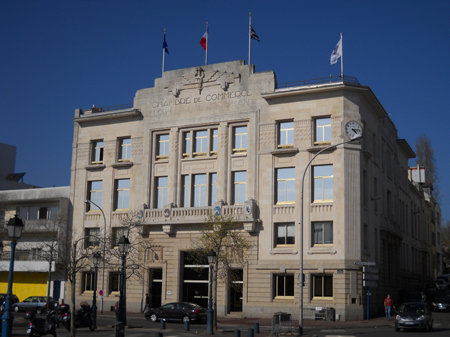 The big building of Chambre de commerce et d'industrie du Morbihan, in Lorient (JLM).